Don’t forget to apply for your Active Kids Voucher before you register with your local team for the 2019 season. 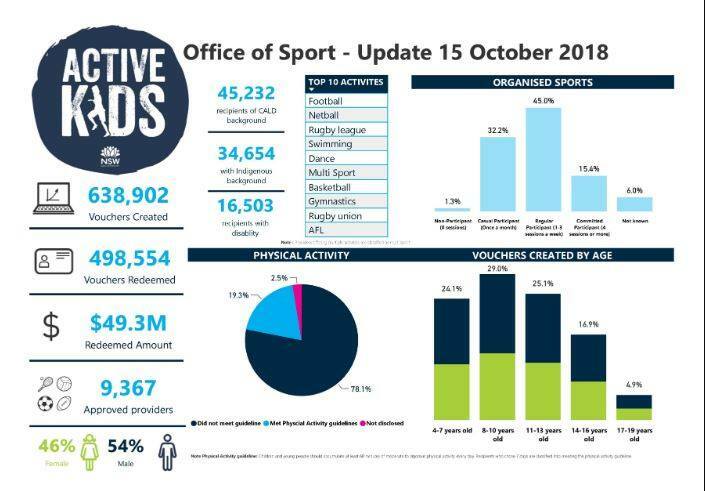 Great to see in 2018 Rugby Union was in the top ten sports for Active Kids Vouchers. If players select ‘training only’ we highly recommend they do not use your NSW Active Kids voucher! Training only (juniors) is only $12 and if they use their NSW Active Kids voucher they forfeit the balance of the voucher ($88). As per, NSW Service FAQs: ‘The cost of activity is less than $100, can the provider claim the full $100?’ No, when the fee is less than $100, the provider is paid the lesser value and recipient cannot use the remaining balance to pay another provider for an activity.